Oklahoma City's Downtown in December began in 2002 as Bricktown and the rest of the downtown area blossomed. Under the operation of Downtown Oklahoma City Inc. and funded by the business improvement group of downtown businesses, Downtown in December has grown exponentially as well. The early years had modest budgets, and 2005 saw one of over $1 million. The event has only continued to grow in popularity and scope. 2017's Downtown in December begins Nov. 10. The event features exciting festivities such as outdoor ice skating, water taxis along the Bricktown Canal, snow tubing rides, plenty of great shopping and food as well as beautiful lighting and decorative displays. See dates/times for specific activities below. Christmas Tree and Lighting Ceremony - The highlight of the event may be the 32 foot tall Christmas tree resting right in Bricktown. A ceremony will be held on Nov. 24 from 5 to 7 p.m. to light the tree with thousands of multi-colored lights. Admission is free, and there will be live entertainment and more. 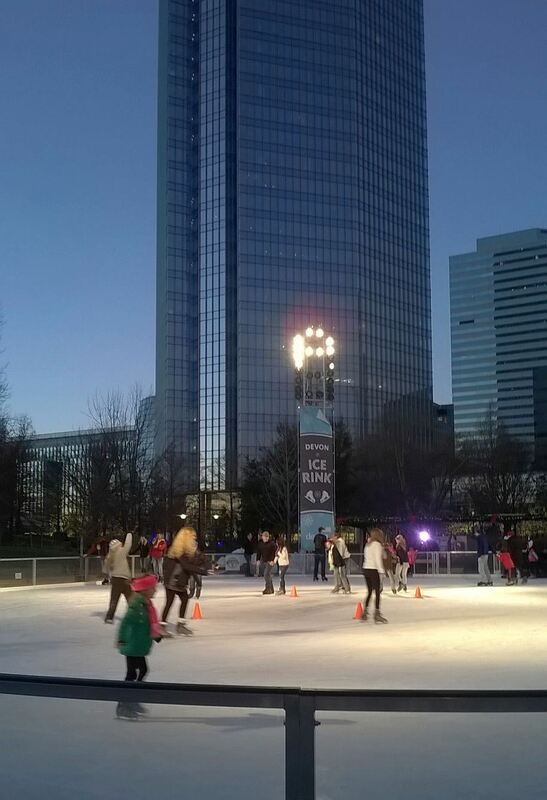 Devon Outdoor Ice Rink - Beginning Nov. 10 at the Myriad Gardens and lasting to the end of January, visitors can ice skate outside from 3 to 9 p.m. Mondays through Thursdays, 3 to 11 p.m. Fridays, 11 a.m. to 11 p.m. Saturdays, and 11 a.m. to 7 p.m. Sundays. The cost is $13 on the 62 by 150 foot rink. It's only $8 if you supply your own skates, and the rink is also available for private parties. Call (405) 297-3423. Snow Tubing at the Brick - Fresh snow blows down two slides, a large one and a children's slide, and visitors cruise down on inflatable tubes. With sessions starting every two hours from noon to 4 p.m., admission is $13. Call (405) 218-1000 to confirm available dates. Holiday Light Displays - From the Myriad Gardens lights around the skating rink to the lights along the canal and in Automobile Alley, there may not be a better collection of holiday lighting in the state. Displays will be lit beginning Nov. 18. Winter Market - Leadership Square is the site for a Winter Market Nov. 25 (11 a.m. to 5 p.m.) featuring live music, hot cocoa and over 40 vendors with crafts, art, jams and other local and handmade goods. SandRidge Santa Run - On Saturday, Dec. 9, take the opportunity to run or walk in a 5k race, a one mile fun run or a children's dash. The kid's race starts at 8:45 a.m., the fun run at 9 a.m. and the 5k at 9:30 a.m. The children's run is free, and registration for the fun run is $20. Advanced registration for the 5k run is $35. Get the registration form online or by calling (405) 235-3500. Devon's Saturdays with Santa - From 10 a.m. to 4 p.m. on Saturdays (12/2, 12/9, 12/16), Santa brings his sleigh to the Devon Energy Center. Kids can sit on Santa's lap, take pictures, write letters to him, hear stories from Mrs. Claus and maybe even meet the live reindeer. Water Taxi Rides - Take an evening ride along the Bricktown Canal surrounded by the lights of the holidays. Do so for free from 6-9:30 p.m. Thursdays through Sundays, Nov. 24 through Dec. 31. Thanksgiving and Christmas night are not included. Downtown in December has been sponsored by a number of Oklahoma corporations, including The Oklahoma City Dodgers, SandRidge, Sonic, Devon and many more.